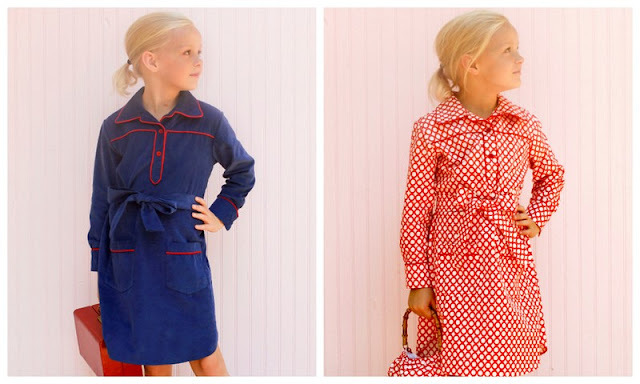 This fabulous, fabulous little Ali-Scott corduroy dress from the Pears + Bears designer Kayce Hughes is 50% off right now. According to their description, the dress was born of a vintage pattern. I love the contrast piping (particularly on the blue version) and the drape of the super fine-wale corduroy. Not exactly a huge bargain (it is currently $43 rather than $86), but definitely a stand-out addition to any little wardrobe. Is this one that is making you wish that it came in women's sizes as well? It does!! Find a camel colored one for mamas here, also 50% off. Oh, and it turns out that all women's and girls' clothing is 50% off right now at Kayce Hughes. I think that you will find something there that will make you smile.